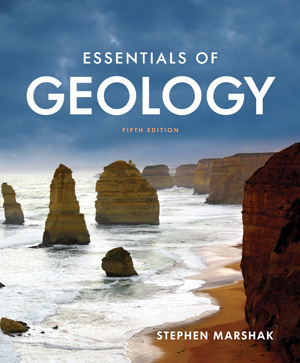 Visit the showcase site for Essentials of Geology. Essentials of Geology masterfully combines visuals, photographs, and short captions to create signature Marshak features—such as What A Geologist Sees—thatt help students connect the visible landscape with the geology that forms it. These features help students to understand even the most challenging of concepts. Marshak has personally worked on all aspects of the Fifth Edition media program—including the new 3D animations and simulations, new Narrative Art Videos, and the SmartWork5 assessment questions—to ensure that the full package builds on the text’s approach and provides students with a seamless, consistent learning experience. Marshak uses consistent and simple pedagogy, based on learning objectives, through the entire text and media program. Smartwork5 integrates with the most popular campus LMS's, with single sign-on and automatic grade transfer, making it easy for instructors to assess their students’ understanding with a range of visual question and activity types that include labeling, drag and drop, ranking, and What a Geologist Sees. All questions are keyed to the learning objectives in the text, as well as to Bloom’s taxonomy levels. Coursepacks work free in any LMS, and give instructors all of the tools they need---such as reading quizzes with new visual questions, real world and Narrative Art Videos, and new animations and simulations with a 3D perspective---to create a rich and engaging classroom experience. All of the Coursepack quiz questions are keyed to SmartWork5 and the text’s learning objectives. A complete Google Earth workbook keyed by topic can be assigned for homework. These Google Earth assignments are also available in the Coursepack and SmartWork5, and the paper workbook can be purchased separately or bundled with the text at no additional cost. 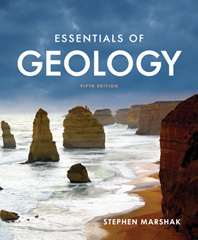 Essentials of Geology, Fifth Edition, is completely up-to-date with discussions on energy and climate change, including: hydraulic fracking, findings from the latest Intergovernmental Panel on Climate Change, and the impact of natural gas and discoveries of North American oil reserves on the global economy. More than half of the artwork in the book has been updated, and every art piece now uses consistent color coding and labeling. New geophysics research and data from Earthscope are covered, as well as Hurricane Sandy, the Washington Landslide, Typhoon Haiyan, the Nepal Earthquake, and the Japanese Tsunami. Essentials of Geology also continues to supply its current events PowerPoint update service with semester-by-semester updates that make it easy for instructors to cover newsworthy geologic phenomena. A range of features throughout the Fifth Edition support students’ understanding of course material. Every chapter opens with clear objectives that serve as a roadmap for the material that follows. Every section includes an extra “Quick Question” to challenge students, while consistent two-page end-of-chapter summaries make for easy review. Did You Ever Wonder questions sprinkled throughout each chapter address issues that typically intrigue or perplex students, and new See For Yourself features direct students to illustrative examples in Google Earth. With the ebook, students can touch a link and “fly” directly to the relevant location via Google Earth.